Tour de Fleece: Yes, I'm actually spinning some every day this time. I believe it's because there is magic in Olive's fleece. She was my dearest girl and I can finally think about her and spin her wool without feeling so sad. The stack of yarn balls is about 3600 yards of singles that will eventually become 1800 yards of two-ply. I needed a little over 1200 yards to have enough for the Antler cardigan that I'm planning to knit. Why are the balls numbered? Because I'm not a totally consistent spinner. Some days I spin thicker, some days it's thinner. When I'm spinning for a big project like this, I attempt to make up for my lack of discipline by averaging things out. The first ball will be plied together with the last one and so on, in hopes that all the skeins will end up close to the same gauge. Those darker skeins are the last of Poppy's fleece and those 500 yards will possibly be combined with the rest of Olive's yarn for something stripey - maybe - still thinking on that. I've loved participating in the Tour de Fleece this year and for some reason, it hasn't been a struggle at all. I've allowed myself to spin a little every day, but haven't felt pressure to accomplish huge amounts every day. I hope this feeling carries over to the actual knitting of my memory sweater for Olive. Fleece preparation: Yes, I'm still washing fleeces, but I'm down to the last of the alpaca fleeces. My trip to Echoview is scheduled for week after next. I'm pretty sure I know what I want to do for the 2013 version of "Fresh from the Farm Yarn". I'm thinking of adding something special to the wool/alpaca blend. I'm excited about having something that's a little different to offer this year. Now it's on to thinking about the color palette for the dyeing that will commence when the yarn arrives back at the farm. More sewing: I made another Squam smock and this one fits. Yay for getting it right! I'm really happy with the way this one looks and can already see that I'll like wearing similar ones with a t-shirt and jeans for cooler weather. I bought some really cute plaid, cotton flannel a few weeks ago and just thinking about it makes me wish for fall weather, even more than I already do. And speaking of weather - this is the main daytime activity on the farm these days. It's finally decided to be summer here in Kentucky, which means hot and humid. Low activity level during daylight hours is the only way to get through the misery. Your yarn is beautiful as I'm sure the sweater will be. I must have missed something--Olive Memory Sweater? What happened to the dear little lamb in diapers who went to your spinning meeting. The last I saw her was when she was being protected by the Wether-man from a bossy older ewe. I'm sure the girls are looking forward to cooler weather too. I don't do heat either!! Olive died last year, just a few hours after I returned from Squam. My post about it is here - http://www.kysheepdreams.com/2012/06/olive.html. This is so sad. Somehow I missed that days' post. She must have known you were coming as she waited to pass until you had been there to see and hug her. Lovely yarn that you have from Olive. Once you have knitted and completed what you will make from her wool - knowing Olive gives the item you make a heart and a soul! You'll always think of her when you use it!! Olive's wool- your spinning- is beautiful. ( Your singles look pretty consistent to me!) Olive will live forever in that sweater. I admire you! I KNOW looking at her wool, and touching it had to squeeze your heart a little bit and bring forth some tears. Your Smock is adorable. 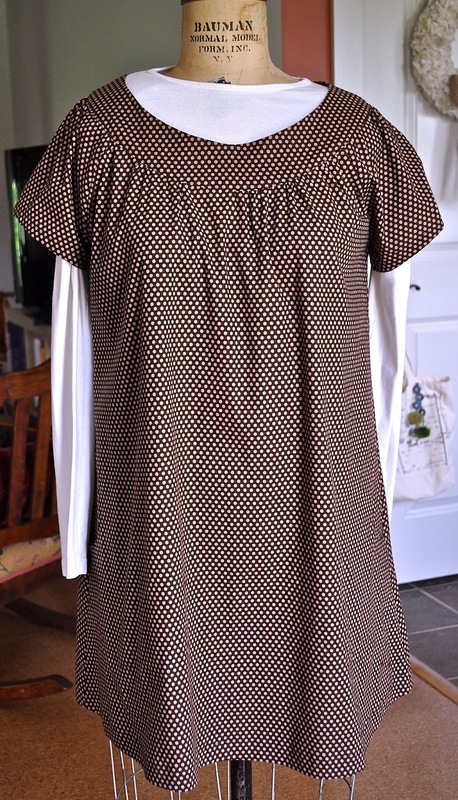 I've seen several apron dresses but cannot find a pattern. You are inspiring me to learn how to make/design my own pattern. The picture of Carson is so cute! Carson the Cat looks like he could provide some "fleece," too! Diane, when I'm in KY for the reunion, could my husband & I come see your sheep and alpacas? I'd love to see them! Those are some amazing looking singles! Congrats on spinning 3600 hundred yards and the sheer amount of yarn you'll have to work with later. It's definitely a fitting tribute to Olive. Beautiful yarn! Glad Carson was so helpful ;-). I LOVE that pattern, it will be a fitting tribute to Olive! Oh, Dianne, that will be the most special sweater ever. Your spinning is amazing.